I'm still in shock at how my little baby boy who I rocked in my arms just the other day is now 10 years old. He's grown up so quickly...but tonight I realized that he is still little too. Tonight after he was asleep, I went into his room to put a pile of laundry on his desk for him to put away in the morning. I shook my head at the clutter on the rug and the dirty gray shirt just tossed in the middle of the floor. But as I started to pick up the shirt, I realized that there wasn't just clutter on the floor. 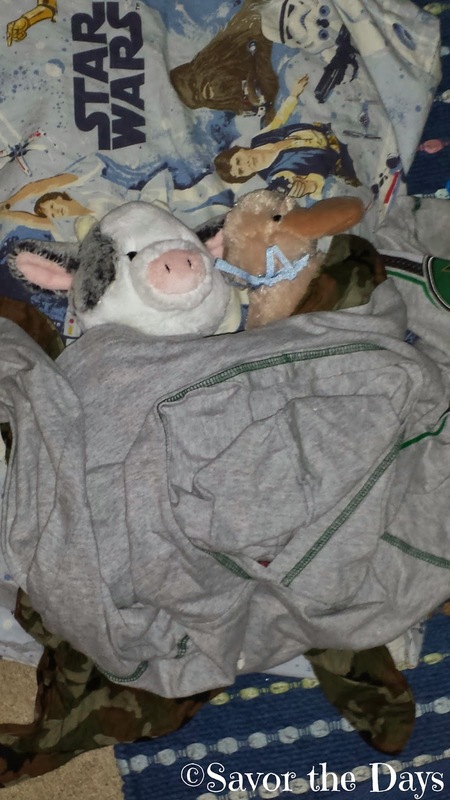 The gray shirt and camo bandana were blankets for two stuffed animals that Nicholas had placed on his Star Wars pillow and tucked in to their makeshift bed before he went to sleep. Oh, melt my heart sweet boy! One of the stuffed animals was his little brown bunny that he got from the Easter Bunny this year. The other is a little cow that Stuart brought back to him last year from a business retreat in Glen Rose. Stuart is back in Glen Rose for the same business retreat this week and I guess Nicholas is giving the cow some extra loving because he is missing his Daddy terribly. He may be 10 years old but he's still a little boy. Sweet dreams, Nicholas!